Looking for the perfect home? Our 2/2 + den villa w/attached garage in the beautiful 55+ community of Heritage Cove is it! The community is a pristine, beautifully mature, landscaped, quiet community...fenced and gated. It offers tennis, bocce ball, shuffle board, bowling teams, TV/Internet and more. The lovely clubhouse has a library, media room, workout room, card room and large community room for parties, dinners and events. Outside the multiple french doors is an olympic sized pool with a large deck / chairs for sunning, a shady area for cooling off, with bath / shower rooms close by. Our villa is lovely and move in ready, perfect for living full time or part time (snow birds), and just enjoying our fantastic weather! Large kitchen area, with pantry, built in office, pass through to the living/dining area, newer faucets, counter tops, Bosch dish washer as well as plantation shutters, security system, new ceiling fans and chandelier in dining, newer AC, washer dryer, water heater, roof and outside paint. Built ins in closets, dining room, guest bedroom. Everything you could possibly need for wonderful southern living! Lots to do and see and lovely views...it's home! Directions: McGregor to A & W Bulb. 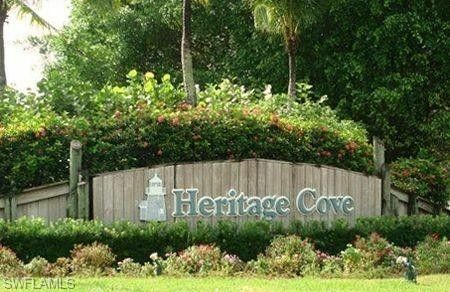 Turn in first left to Heritage Cove and go to key box. Once through the gate, turn right, and then right at the first street, it's on your right.